Recently, I have been helping my parents clean out their house. I have continually been shocked by how much they have been able to accumulate over the years. A few weeks ago, I stumbled into their old record collection. I was flabbergasted that my parents actually used to listen to good music. We were able to sell most of their old records to a nearby record store, but some of them were in such bad condition that the store would not buy them. Not wanting to throw them away, I wanted to use them as part of a craft project. Have any old records lying around? This project from Joan Fee of Express Your Creativity is a great craft project that is perfect for reusing old vinyl records. 2. Turn pie plate upside down. Place record on top. Place in oven for 3-5 minutes. Ovens vary so keep an eye on it. 3. Wearing gloves and using hot pads, place record inside pie plate to form. Let set until hard. It won’t take very long. 4. Repeat with record over the glass except when removed from oven, leave record on glass to cool. 5. Glue flat objects over holes in record. Let dry. 6. Place tall record piece in pie-shaped record. If pump is adjustable, use at lowest setting. Place pump in tall piece, using suction cups, if provided with pump. Cut tube to slightly lower then rim of record. Cover pump with water. Test pump. Fill pump area with desired filler objects. And stay organized with all these new crafts and vinyls. Here’s a great way to get organized. As the old saying goes, one person’s trash is another person’s treasure, and that cliche saying turned out true for me. Last weekend, my friend and I were walking along on our way to get something to eat when all of a sudden he darted into an alleyway. I followed him, until we were standing in front of a back door. Next to the door was a box of old clothing, filled with dirty but otherwise high-quality clothing, from nice wool shirts to corduroy pants. Neither of us wanted to wear the clothes, but we couldn’t stand to see it go to waste. We took the box home and washed the clothes thoroughly. Now with a pile of clean clothes, the only thing I could do was craft with them, and craft we did. Over the past week, my friend and I have gone on a crafting spree, using this great haul of clothes to make things we would actually use. Using these Green Sewing and Knitting Tips, I cut off and saved all the buttons and zippers to use on future projects. Using the padding and cloth from a thicker winter jacket, I decided to Sew a Padded Laptop Tote to protect my computer when I travel. My friend used the old clothing to sew for himself a Quick and Easy Half Apron to keep himself clean when he cooked in the kitchen. That pile of old clothing was trash to someone, but it was a treasure to us thanks to some basic sewing skills and a little craft know-how. I never let my old sweater see the light of day. I still distinctly remember awkwardly standing in my grandmother’s living room, draped in some kind of extinct animal my grandmother had the audacity to call a “cute sweater.” When I was 10, my grandmother, with killer gift-giving instincts, got me exactly what every 10-year-old boy wants, a hideous uncomfortable sweater. I still get goosebumps every time I think of it. For years, I let that sweater hang in my closet. I detested it, but it was from my grandmother after all. I knew she got me that gift out of love, and after a while the sweater gained a little sentimental value. Eventually though, I couldn’t let it hang in my closet any longer. Something had to be done. If you’re like me and you have a sweater that you never wear anymore, then here are some tips to help you salvage that sweater. Don’t throw it away. 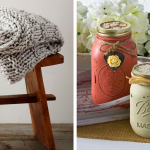 use some of these great tips to turn that old sweater into a great new craft. 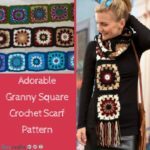 If you knit, crochet or even weave, salvage the yarn from an old sweater to use in a new project. Stitch several layers of the old sweater together and add binding or trim around the edges to create potholders. 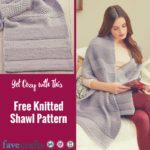 For more great tips on ways to recycle sweaters, check out FaveCrafts’s 10 Ways to Craft with Old Sweaters. So my mom and I are babysitting my two nieces tonight, actually they’re sleeping over. So of course we needed to find some kind of craft to keep them busy, it’s not always easy entertaining a 3 and 4-year old. So we found this really cute craft that’s made for elementary kids, so it has to be easy enough for them to do, with our help of course. I know we’re sick and tired of the rain, but why not make rain sticks? It’s a fun craft for the girls to do and although it might give my mom and I a headache, it’ll entertain us all. 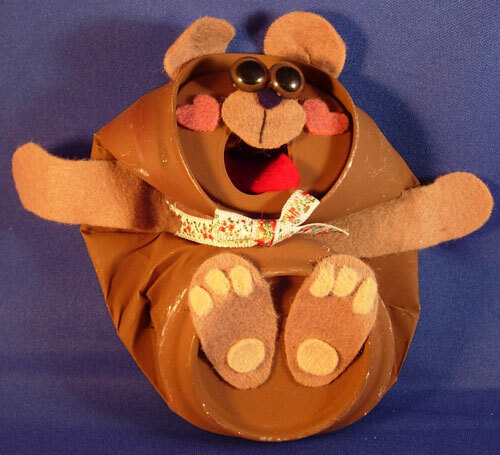 All we’ll need is some construction paper, some rice for the inside noises and a few other materials. It doesn’t seem like it’d be too messy either. 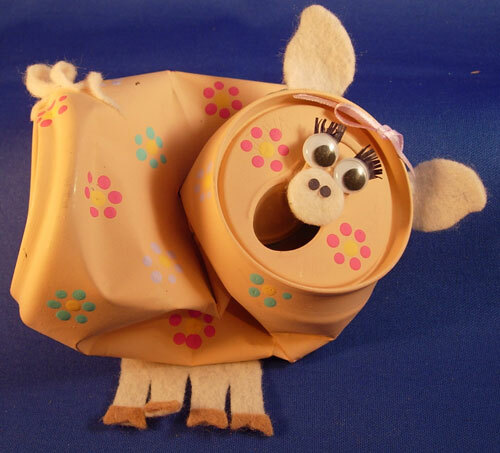 Another really cute craft that I just adore are the smashed soda can animals. I came across these the other day and I just fell in love with them. They’re a bit more complicated to put together than the rain sticks will be, but we might have to give it a shot. I mean really, how adorable are these animals? I almost just want to make a collection of them. Would you make these with your grand-kids? I found this site called Scavenging that reuses…well, everything. 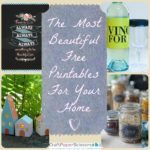 It’s not really a crafting site, but definitely check it out for money-saving tips. 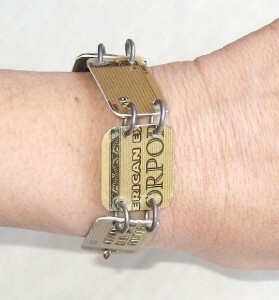 With just an old credit card, some metal rings, and just a few tools to create the bracelet you can make something that looks like it came from a store. For some extra bling try using your platinum or gold card. Check out the full step by step directions here. This idea is from Kayte Terry at CraftStylish and it is so cute! 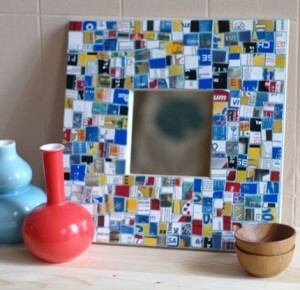 Use a variety of colorful credit card pieces for this crafty mosaic. Even if your cards are already cut up, it’s not too late! This mosaic is great as a picture frame, border around a mirror, or even just as a wall decoration. This is seriously the easiest craft project I’ve ever seen. Instructables.com gives you step by step directions of how to make these, but I think you could even do it on your own! 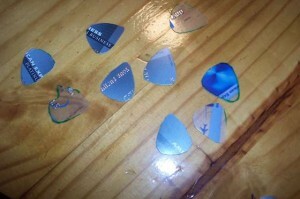 All you need is scissors to cut your old credit cards into trendy guitar picks. If you don’t play guitar, these could make for a great low-budget gift for any occasion. For the project instructions click here. Not all of us are this crafty but recycled materials are becoming a new trend. If you are interested in buying some credit card crafts, check out these recycled credit card earrings or this credit card pendant necklace. Extra old CDs? Recycle Them! This Wednesday, April 22nd is Earth Day, a great day to think green. There is no easier way to show your concern for the environment than recycling. 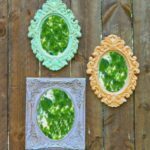 Over at FaveCrafts, we have a number of great ideas for recycled crafts, with everything from beginner crafts to kid-friendly projects. Here are five of our favorite recycled craft projects, just in time for Earth Day. 1. 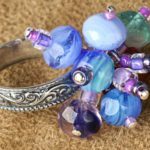 Faux Dichroic Glass Recycled Bottle – With the help of polymer clay, recycle an old wine bottle, perfume bottle or other glass bottle into a decorative container. The techniques makes the bottle look like colorful dichroic glass with no glasswork experience necessary. Use the container as a vase or a liquid container for oil, vinegar, or other. 2. Turn Old Jeans Into Potholders – The jean pockets, already ready for slipping in your hands, make this sewing project a breeze. 3. 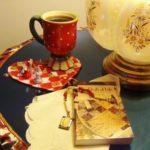 Top 10 Recycled Magazine Crafts – Instead of tossing out that pile of old magazines you have lying around, why not turn them into some great reusable household items? 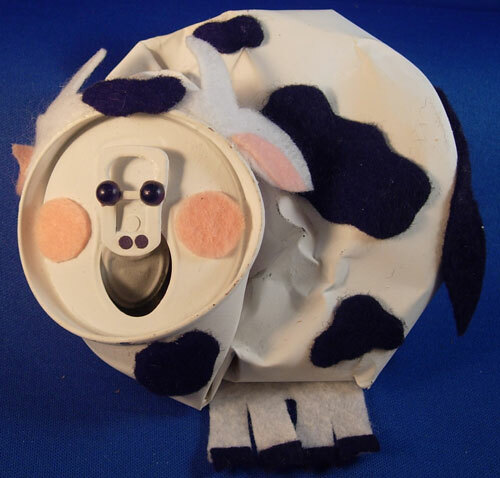 Not only is making crafts from recycled material fun and easy, it’s kind to the environment. 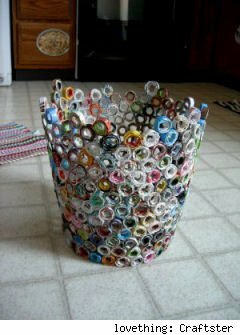 Try one of our top 10 ways to craft something new out of old magazines. 4. 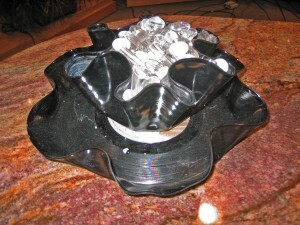 Vinyl Record Bowl – This simple craft turns a vinyl record into a bowl for dried items. This makes a great gift for a music enthusiast. 5. Recycled Leather Belt Bracelets – Recycle thrift store or old belts into fun and funky bracelets. You can make 3, 4 or even 5 bracelets from a single belt and give them all different personalities with earth friendly paints, chains and beads. Why not make a batch of these for gifts or to coordinate with every outfit you own?